When working with horses it’s important to develop your leadership skills so that your horse will respect and trust you and you want them to feel safe. There are those that don’t like the word leadership because they give it such meanings as being dominant, forceful, bully etc. Now I know there are trainers out there that are very dominant and forceful with their training methods because I’ve seen it and I certainly don’t agree with it. That is not the kind of leadership skills I teach in my TLC courses. Leadership to me means to motivate, inspire and instill trust. I’m a student of the horse and it’s all about them. 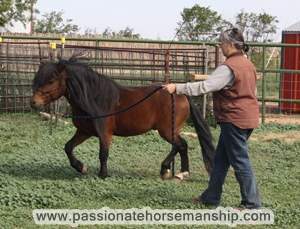 But, it’s also important to set boundaries with your horse and is something that is done within the herd. If you want to be good with horses learn how to think like a horse. Don’t put your human feelings into your horse. In the wild horses follow the leader for their safety and will instinctively seek leadership. Horses are herd animals and every herd has a leader that they follow. Within the herd you will find a defined pecking order also known as that dominance hierarchy. If you had the opportunity to watch a herd you would see the leader or Alpha horse which is usually an old mare. All of the horses in the herd are submissive to the leader when it comes time to eat or drink. The leader will lead the herd to food, water, shelter and safety. If any of the lower ranking horses break the rules of the herd they’ll be run off and that makes them really vulnerable. The leader runs the offending horse away from the herd to teach them to be submissive and dependent upon the leader for their survival. A young horse is kept in line with a look, possible nip, gentle kick or the laying back of the ears. Each horse knows its place within the herd, but they are always testing one another. The horses are always testing one another to see if they can move up in the hierarchy. This is why it’s so important to develop you leadership skills and be consistent when working with horses. In my TLC Foundation course I’ll help you to set up a great foundation and you will develop your leadership skills without using force, fear or intimidation. You’ll also learn how to set boundaries like horses do with each other in the herd. Leadership Skill Tip: Always be aware when you’re around your horse to their body language. You’ve got to notice the little things and nip them in the bud otherwise they’ll turn into the big things. If you see them pin their ears and it’s toward you make them move away. The lead horse would not tolerate this and would move them away so think like a horse. To learn more about my TLC Foundation course visit this page.